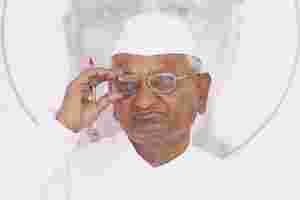 Mumbai: Smarting under poor response and bad health, Anna Hazare on Wednesday called off his fast a day ahead of schedule and repeated his threat to campaign against Congress in the five poll-bound states for not brining a strong Lokpal. Hazare did not make any reference to the earlier plans of coming to Delhi for a dharna of the residence of Congress chief Sonia Gandhi and Rahul Gandhi and about the jail bharo agitation (filling up of jails) after that. “...Whatever we are seeing today in Parliament is tragic. So I have decided to call off the fast today. There is only one way now. We will make a programme in the five states and go and awaken people there. I will tell them don’t vote for traitors," he told a sparsely attended protest meeting in the afternoon. “Now two years are left for the general elections. In between, I will go to various parts of the country and keep awakening the people till next general elections," he said. The ending of the fast by Hazare, who was having fever of 100 degree F, came doctors advised him to call off his protest saying continuing it will lead to kidney failure. Hazare said he was already fasting four days before the start of the protest strike on Monday here. Later in his speech, Hazare said he was defering the jail bharo agitation indefinitely as it would not be proper now go ahead with the plans. He said they will go ahead with a voters’ awareness programme in the five poll-bound states. Asked by a reporter whether he had to call off the fast because of poor crowds and why he was not able to attract people in large numbers, Hazare said, “this is not correct. I don’t have power or wealth. Still people are coming in big numbers and you will see them again when we do campaign during elections." To a question whether Hazare and his team would stage outside BJP MPs’ houses as they did not support their demand for strengthening CBI, Team Anna member Arvind Kejriwal said the jail bharo agitation and dharna have been called off. “Everything has been called off," Kejriwal said. Queried whether Congress was being made a villain, Hazare said they had no reasons to oppose other parties. “In the last five months, it was the UPA government has betrayed us. They were betraying us again and again in the past one year," he said. One reporter asked whether he will campaign against BJP which betrayed the Hazare campaign in Lok Sabha on Tuesday and whether Team Anna was not following a wrong strategy, Hazare said, “Congress has cheated them the maximum." Hazare suddenly left the dais after this question despite repeated queries from media persons to clarify his position whether Sonia Gandhi and Rahul Gandhi are their main targets.